Arab armed forces have performed poorly in numerous areas of warfare. These problems—too many to list here—range from poor tactical leadership by junior officers to poor strategic leadership by generals, from mismanagement of information to struggles handling weapons. Other problems include unit cohesion, terrible equipment maintenance, and sub-par training. Pollack identifies four theories that experts have proposed to explain the weaknesses of Arab armed forces: reliance on Soviet-style doctrine and military methods; poor civil-military relations and the "excessive politicization of Arab militaries resulting from the constant coups—and coup-proofing—endemic to the Arab states"; economic factors, particularly the "chronic underdevelopment of the Arab states throughout the post-World War II era"; and "patterns of behavior derived from Arab culture." "Although numerous observers have written books, articles, and papers arguing for one explanation or another, no one has ever looked at all of them collectively to try to deduce which are wrong and which right; whether these recurrent patterns of Arab military ineffectiveness could be traced back to just one overarching source, or a combination of some or all," Pollack writes. "No one has ever tried to sift through them and figure out which ones hold water, and which are just hogwash. That is the purpose of this book." Pollack's first takeaway is that relying on Soviet military doctrine is not the cause of the Arabs' military problems. To the contrary, the Soviets were more helpful than hurtful. Regardless, there was no correlation between an Arab military's reliance on Soviet methods and its performance on the battlefield. Second, politicization was a problem, but not the most important one. It definitely hurt the effectiveness of Arab armed forces in many ways, but "deficiencies in tactical leadership, tactical information management, air operations, weapons handling, and maintenance persisted regardless of how politicized or professional they were." Third, economic underdevelopment was similarly an "element of modern Arab military ineffectiveness, and arguably an important one—just not the most important one." None of the non-Arab militaries that Pollack examined experienced the same difficulties that were the greatest problems of the Arab armed forces. The main source of Arab military ineffectiveness is culture. "It seems unlikely that it is mere coincidence that the most damaging problems that Arab armed forces have suffered in battle just happen to conform perfectly to patterns of behavior emphasized by the dominant Arab culture," Pollack writes. 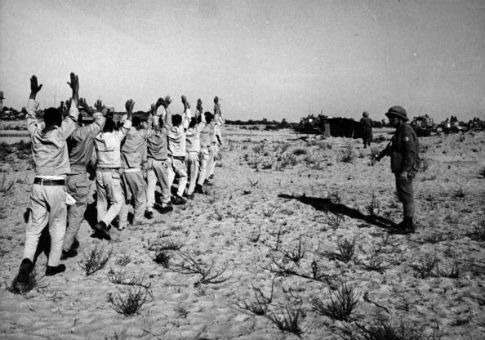 "It gets even harder to buy given that Arab organizations in other walks of life experience precisely the same patterns of behavior as their armies, despite the fact that those other organizations were not trained by the Soviets, nor were they subject to coup-proofing or other forms of politicization, nor did they behave like similar organizations in other developing countries." Pollack identifies key aspects of Arab culture relevant to the book: conformity, centralization of authority, deference to authority and passivity, group loyalty, manipulation of information, atomization of knowledge, personal courage, and ambivalence toward manual labor and technical work. One can see how these values and behaviors will negatively affect military performance, especially the most glaring problem for Arab armed forces: poor tactical leadership from junior officers. Consistently, these officers fail to show any initiative or creativity—they rarely if ever adapt quickly to changing circumstances in battle. This makes perfect sense, though, if one considers these soldiers were trained to conform and defer to authority. This stands in stark contrast to the Israeli military, whose soldiers were raised in the "Start-Up Nation," which encourages innovation from all ranks. The education system in Arab societies drilled in these values to the point that they became central to soldiers' behavior. "Typical Arab educational practices relentlessly inculcated the values, preferences, and preferred behavior—the culture—of the wider society," Pollack writes. Pollack also explains that Arab military programs are modeled on the educational methods of the larger society, reinforcing certain patterns of behavior and conditioning soldiers to act and think in "ways that reflect the values and priorities of the dominant culture." Pollack's findings present hurdles for the United States, which has spent decades trying to build more effective Arab militaries. The logic behind this approach is simple: Partners in the region can act as force multipliers for Washington, lessening the burden on the American military. When these efforts backslide, however, the United States often has to deploy more of its own soldiers or, at the very least, invest more resources to help the locals fight. If Arab culture is the main source of the Arabs' military woes, then sending their leaders to American military schools will not be sufficient, nor will more training. The United States can take certain steps, some of which Pollack discusses, to make moderate, but still significant, progress, but anything more would require broader changes in Arab society—a much taller task. Another related problem for Washington is that its Arab allies cannot be expected to counter the greatest threats in the region: Iran, Iran's proxies, and Sunni jihadist groups like ISIS. The Iraqi Army's breakdown in 2014 proves this point for the latter. The United States is effectively seeking an unofficial alliance of Arab states (and Israel) to counter Iran's aggression in the Middle East. It may give Arab states billions of dollars in military aid and sophisticated weapons, but these countries have far fewer soldiers on whom to rely in a conflict with the Islamic Republic, and those whom they have are less battle-tested. Only Egypt and Turkey have comparable numbers, but the former is weak and the latter has close economic relations with Tehran. Beyond conventional strength, Iran is also much better than the Arabs at training foreign fighters and creating proxy forces. Pollack makes a crucial point: The Middle East is going through unprecedented changes—social, economic, technological, and political. This transformation will affect Arab culture and may even "benefit Arab armies in combat." Additionally, warfare in the 21st century is changing. It is possible that the Arabs will adapt better as the world moves from the Industrial Age to the Information Age. The future is uncertain, but Arab militaries could become more effective. The United States should care about the effectiveness of Arab armed forces, but the reality is that a sustainable security system in the Middle East requires active American military power on the ground. The United States should work to strengthen allies, but that is not sufficient. History proves that when America is not actively engaged in the Middle East, it will inevitably be forced to return to the region and in a more forceful way. The United States must decide whether it will lead in the Middle East or be an uninvolved bystander. If Washington chooses the latter, it better prepare itself for the inevitable disaster to come.